Visual merchandising creates a pleasant environment for your patients, draws in people walking by your practice window, and sparks social media engagement. We've mentioned the importance of designing your eyecare practice, but now we want to show you where you can source ideas and materials to build your own displays. With these eyecare practice marketing tips, we can show you how to develop a compelling brand image for your eyecare practice. The Optical Vision Site has got some great resources to share, and we hope to see more practices decorated with these fun and conversation-starting eye themes! Builds your personal and store brand - think first impressions. Enhances customer comfort and ease of shopping. Gives you personality - sets you apart from your competition. Promotes positive online reviews and user-generated social media content. You don’t have to be a brilliant visual merchandiser when you have an arsenal of tools available online. Which is why we have several merchandising ideas for all types of spaces on our Pinterest board. If you are looking to put a big sign, indoors or out, check out some of the ideas here on our Shady Sculpted Signs board. Thinking of redecorating? Check out our Visual Merchandising board. This board has all sorts of color combinations, eyewear displays, and layouts. You can see more from Fashion Optical Displays. Need some ideas for Window Displays - large and small? 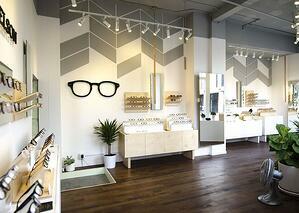 See our Merchandising Eyewear Display. Want to add a few ‘Eyewear- Eyeball Accents’ into the office? 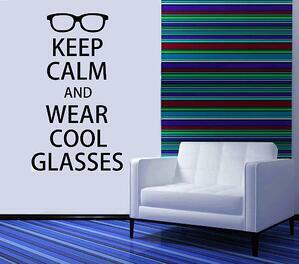 Check out our Merchandizing Board: Optical Decor. Look at eyeball chairs and lamps, eye chart decor, and optometrist decor. All accent pieces come with the theme of eyeglasses and eyeballs, which is great if you have young kids visiting. Need some ideas to inspire your patients on Sunglass Storage? Check out Super Sunglass and Eyeglass Storage Ideas. These are fun DIY projects that you can show your patients or make yourself and put in some dead areas in the exam room, the bathroom, or even down the hall. Got some old eye charts and want to reuse them? Check out our Pinterest board Eye Charts. We also have Eye Charts scattered through the other merchandising boards. Other eye decor you can find on Eye Got Time, which features eyewear with watches and clocks with eyeglasses and eyeballs. A few accent pieces to put in the office. Use the following keyword search on Pinterest or Flickr or Google: visual merchandising, retail store display, store window, retail merchandising, retail design, retail store windows, and vm design. Good luck decorating. Remember to follow Apple's methods and always think about the patient experience first.